Flip Out Mama: Baby Shower Bash: Baby Dipper! The Baby Dipper bowl is our next Baby Shower Bash sponsor! This is one of those great ideas that I wish I had thought of myself! The Baby Dipper was created by a mom of TWO (!) sets of twins who desperately needed a way to feed them with only one hand. And that is how the Baby Dipper bowl was born! It has a nonstick bottom that keeps it from sliding around on the table. The bowl also has a sloped interior surface and a spoon shaped collection point on the inside that helps all of the food move to one area, so you can get every last drop. 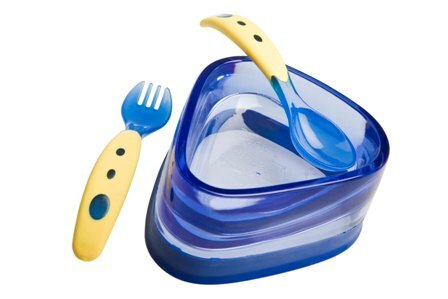 Not only is the Baby Dipper bowl good for feeding babies, it is also super helpful for toddlers who are learning to self-feed. I am really excited for Crystal to get to try the Baby Dipper Bowl when Sadie is just a little bigger! I am sure she will really appreciate being able to feed her with only one hand! Thanks so much to Baby Dipper for letting us try this awesome product! disclosure: I received a sample product in exchange for this post. Although a sample product was received, no monetary compensation was received, and all opinions are my own.